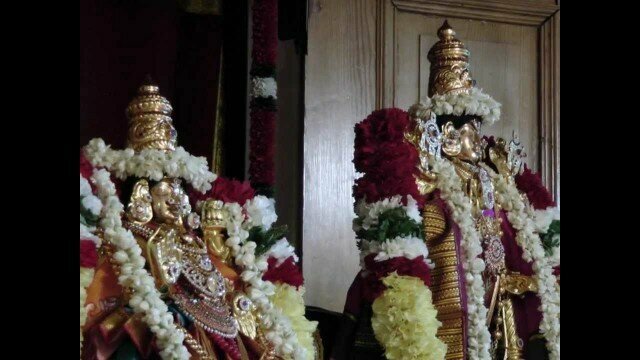 Sri Senkamalavalli Thayar (Mahalakshmi) Samedha Sri Devadhirajan Perumal (Narayana) Panguni Uthiram Serthi Seva @ My Home Thirumaligai (Sanctum). The accompanying Sanskrit Hymn is rendered by Smt. Mani Krishnaswami. My Home Thirumaligai operated out of a Basement Space hosts Sriman Narayana with his Consorts Sridevi-Bhudevi, Sri Mahalakshmi , Sri Yoga Narasimha, Sri Lakshmi Narasimha, Sri Dolai Kannan (Bala Krishna), Sri Aandal, Sri Ram Parivar, Sri Ramanuja , Sri Manavalamamuni & Sri Satyanarayanaswamy. All Alangarams, Daily rituals (Thenkalai Nithyanusandhanam Sampradaya) and Kainkariyams are performed for the Lord including all auspicious events. Panchaparva Seva & Thirumanjanam (Holy Bath) is performed on Ekadesi, Amavasya, Purnima and when Revathi Star is in Ascendence. The images and clips used in this Video are of my Home Deities during Prayer Observance (Sanctum). The audio/sound recordings are used where ever necessary without any commercial intentions or monetary benefit according to “Fair Use” and mainly for educating audience into Vaishnavism, Dravida Vedam (Divyaprabandham), Works of Acharyas, Sanskrit Vedic Hymns, Shlokas, Mantras, Carnatic and Devotional music by providing visuals for better appreciation and for listening pleasure & spiritual realization. Most of the Shlokas, Mantras, Vedas and Divyaprabandhams are available in Public Domain and is recited in all Vaishnava Temples & 108 Divyadesams. Vishnu (Sanskrit विष्णु Viṣṇu) is the supreme God in the Vaishnavite tradition of Hinduism. The Vishnu Sahasranama declares Vishnu as Paramatman (supreme soul) and Parameshwara (supreme God). It describes Vishnu as the All-Pervading essence of all beings, the master of—and beyond—the past, present and future, one who supports, sustains and governs the Universe and originates and develops all elements within. Vishnu governs the aspect of preservation and sustenance of the universe, so he is called “Preserver of the universe”. In almost all Hindu denominations, Vishnu is either worshipped directly or in the form of his ten Avatara, most famous of whom are Rama, Narasimha and Krishna. Narayana (Sanskrit: नारायण; nārāyaṇa; Kannada: ನಾರಾಯಣ; Telugu: నారాయణుడు; Tamil: நாராயணன்) or Narayan or Naraina is an important Sanskrit name for Vishnu, and in many contemporary vernaculars a common Indian name. Narayana is also identified as the original man, Purusha. The Puranas present divergent views on Narayana. In the Kurma Purana he is identified with Brahman and Krishna-Vishnu. Narayana is another name for Vishnu and appears as the 245th name in the Vishnu Sahasranama. Śrī or Lakṣmī is also the personification of the Spiritual energy within us and universe called Kuṇḍalinī. Also, She embodies the Spiritual World or Vaikuṇtha; the abode of Lakṣmī-Nārāyaṇa or Viṣṇu, not to be confused with Heaven, as The Heavenly Planets are still part of the Material Universe. Vaikuṇtha-Dham is purely spiritual, eternal and self illuminating. She is also supposed to have the Divine qualities of God and the soul. Lakshmi is God’s superior spiritual feminine energy or the Param Prākṛti, which purifies, empowers and uplifts the individual. Hence, She is called the Goddess of Fortune.